The festive folk at Funcom have managed to pull off a gaming event involving killing a goat that won't get the gaming community upset as part of the holiday festivities in Age of Conan. Unlike that other video game goat-killing event, Funcom keeps things virtual with it's holiday goat hunt, with a prize package consisting mainly of the game's pre-order bonuses and two months free game time up for grabs for whoever manages to down one of the poor creatures. The trick is, there's only one goat per server, so only one person per server can win. 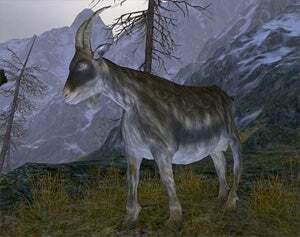 Riddles as to the goat's location can be found at the official site, along with a listing of servers where the goat has already appeared and went down. While some servers have already held their events, more will be having theirs on the 29th, 30th, and 31st, so who knows? You might still have a chance to get your goat. What you do with it when you get it is your business.